UDL files can be incredibly useful for a variety of reasons (please see my earlier post for details). In this article I will explain the steps for creating and configuring a UDL file. First create a new text document in Windows Explorer and give a name to your new file, making sure you set the extension to .udl (or you can open notepad and save it using .udl extension). Either way, make sure nothing is entered in the notepad document. Now double click your new .udl file in order to open it. 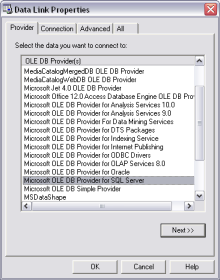 Windows will bring up a .udl file editor that looks very similar to what one sees when setting up an ODBC data source. 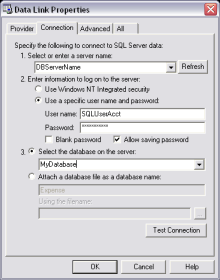 A situationally useful option is given that allows you to save the password of the SQL Server user account you would like to use to connect to the database server. Although if misused it could be a security risk, this can be used when safely behind the network firewall and is quite useful when for example managing the credentials of a large number of reports. You are also asked to identify the database to connect to. Once you have provided the necessary information on the Connections tab, click the ‘Test Connection’ button. If all has gone well, the test will run and a message will appear saying that the test was successful. If so, then congratulations, you now have a working .udl file!